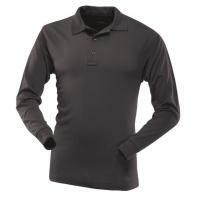 Tru-Spec incorporates high-tech performance in this traditional looking long sleeved Polo shirt. The snag-resistant polyester jersey material wicks moisture away from the skin for all-day dry and comfortable wear, and its military spec Silver Plus anti-microbial finish prevents odors from building up by killing 99% of bacteria. The Polo is certified UPF of 50+, perfect for sunny days. Side vents and gusseted sleeves maximize wearer's range of motion. The extended back ensures that once tucked in, it stays tucked in. For extra convenience in the field, the shirt includes a mic holder at the bottom of the placket and a two-pencil pockets on the sleeves.